Using a large kitchen knife, trim the top off the garlic, so that all the cloves are exposed. Press down on the garlic (using your hand or the flat side of your knife), to loosen the cloves a bit. Pour in a bit of olive oil, and let it absorb into the space between the cloves. Repeat a couple of times, until about a tablespoon or two of olive oil has been used. 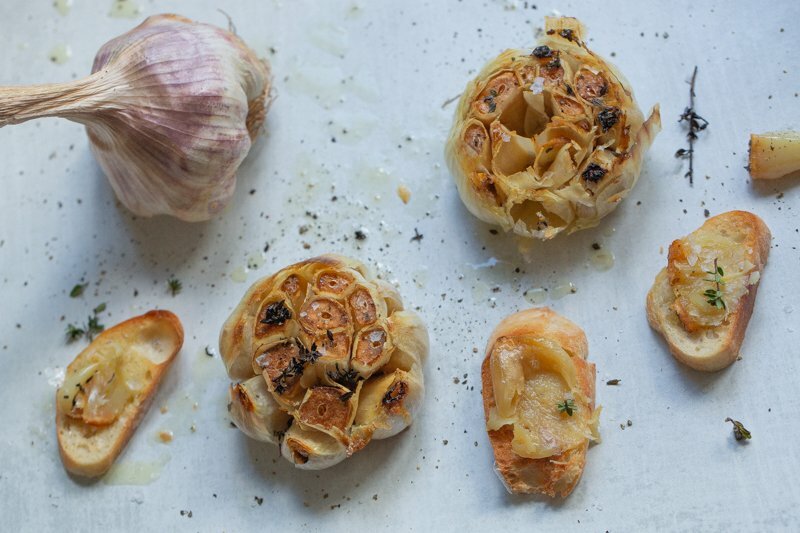 Sprinkle with salt, pepper, and thyme, and roast the garlic. We use our trusty little toaster oven for this, set to 375°F for about 30 minutes until the garlic is soft and golden. Serve right away, sprinkled with more salt and pepper.